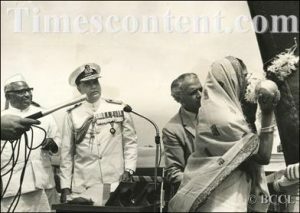 Mrs. Indrani Devi, wife of the Union Defence Minister, Mr. Jagjivan Ram, breaking a coconut against the prow of the third leander class frigate ‘Udayagiri’, to mark the launching of the frigate from the yards of Mazagaon Dock in Mumbai. Looking on from left are :- Mr. Jagjivan Ram, Admiral S.M. 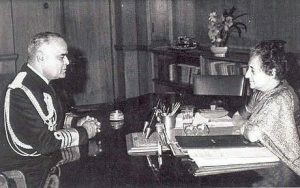 Nanda and Vice Admiral B.A. Samson on October 24, 1972. Extracts from Warring Nuclear Nations –India Pakistan. Memories are made of this. The ferocious and rare White Tiger, painted across each flying fighter machine, gives its name to the British Seahawk Jet Fighter Squadron INAS 300 operating from INS Vikrant. The Cobras are the French built Alize Squadron INAS 310 flying off the Vikrant for ground and anti-submarine missions with latest ARRAR EW system which was new to India when Vikrant first arrived and the Alizes few sorties for the Army ands Air Force in 1965. Ships got the UA8/9 more advanced system on INS Nilgiri. . 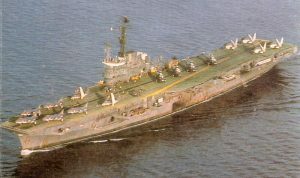 The Vikrant and the planes were received by Pandit Nehru in 1961 and writer was Acting Flag Sub Lt to FOCIF Radm BS Soman and went out with INS Beas with Custom officers to clear the ship and many transfer of residence and paying minimum duty as the Custom officers were kept in good spirits and access to the ship’s canteen, and learnt the vast powers a Custom Officer has. The cream of pilots were on board and Sea Hawks were commanded then by Cdr Acharya in 1961 and now led by Lt Cdr S. Gupta, an ex Doon School Alumni and the Alizes by Cdr (O) M.K. Roy in 1961 and led by late Lt Cdr Ravi Dhir. The Tigers were waiting to kill and the Cobras to bite. COX’S BAZAR ATTACKED BY EIGHT AIRCRAFT. ALL AIRFIELD INSTALLATIONS DESTROYED. AIR TRAFFIC CONTROL ON FIRE. POWER HOUSE AND WIRELESS STATION SEVERELY DAMAGED. FUEL DUMP ABLAZE. The Seahawks went screaming away again to wreck the well fortified Chittagong airfield. Facing medium-to heavy anti-aircraft gun-fire, their results were one harbour craft and control tower damaged, fuel dump set ablaze, two gunboats immobilized, six Pakistani merchant ships attacked in outer anchorage, and two damaged heavily. CHITTAGONG HARBOUR AND BASE UNDER HEAVY AIR ATTACK. With the Tigers digesting their kill, the Cobras gave no respite at night. 4 December saw the Vikrant’s finest hours, the pilots and 1200 ship’s crew writing history with bravery. Cdr H.M.L.Saxena Second in Command as XO (later DNO) pepped up the men who only had short catnaps. Cdr Bilo Choudhry, the tough-talking engineer kept the engines full steam ahead, despite problems in boilers restricting speed to snsure speed on deck for flying. The escorts Brahmputra (Capt J.C.Puri) and Beas (Cdr L.Ramdas) in company of the Vikrant (Capt S. Prakash ) had their share of excitement when they attacked what they thought was a submarine. Lt. D’ Silva and sub-Lt Hukku saw a periscope and 4.5″ guns opened up on the contact but this was possibly a false contact (similar to incidents in the Falklands). This submarine ‘kill’was declared much later and got mixed up in media with that of PNS Ghazi which was sunk earlier. FOC-in-C Vice Admiral N Krishnan had told Maj Gen Jacob about a submarine kill and there was confusion on that too. However this boosted Eastern Naval Command morale with the fliers having created havoc ashore. In war many myths arise till the official papers are released and married with reports the enemy has made and loss of a submarine is a big loss. The history of the Pakistan brought out much for this author. The truth comes out but such research and analysis is absent in India in all its wars and major operations namely 1962 China War—the 1965 War where Navy was told to stay below Porbunder and avoid the enemy—1971 war as this writer has attempted to write and made mistakes in an earlier book —A Nation and Its Navy at War written in 1991 and Ops like Pawan but books have been written with experiences of those who took part. Vikrant picked up a submarine contact at about 1330 hrs and carried out prompt attacks with mortars. Escorts joined the deliberate attacks compelling the submarine to come up fast at a steep angle, the bow and part of the fin breaking surface in a flurry of frothy spray. She fired a couple of torpedoes which went wide. A few 4.5″ shells caught on her casing. Alizes joined the fray and the sub got their depth charge with a loud flash. The submarine was seen diving—or was she dying?—never to be heard of again. In the West: CNS Nanda hoped the Western Fleet would open the War Orders for a missile attack off Karachi. The Pakistani Fleet failed to come out, which confused Fleet Commander Chandy Kuruvilla who opened the War Plan Orders to attack Karachi with the missile boat attached in tow. A civil Cessna flew some distance from the Western Fleet, which was around 150 nm from Karachi. The Fleet Operations Officer felt the Fleet’s position was compromised and failed to head for Karachi. The C-in-C West (Vice Adm S.N. Kohli) too opened orders, anticipating his fleet being on its way to Karachi, with a missile boat, but the Fleet got sidetracked into intercepting merchant ships and began a hunt for the Pakistani Fleet. This is when Adm Nanda spoke to Adm Kohli and Kohli set in motion the attack on Karachi by K25. The Kiltan (Cdr Gopal Rao) for Command and Control and the Katchall (Cdr K.N.Zadu) were to accompany the Nipat (K25 Cdr Babru Yadav, CO LtCdr B.N. Kavina), Nirghat (Lt Cdr I.J. Sharma) and Veer (Lt Cdr O.P. Mehta) were put on their way. Kohli kept asking whereabouts of the Fleet with Nanda anxious to hear good news, but got wireless silence. The C-in-C in the Maritime Operations Room (MOR), had fingers crossed, having let his killer dogs loose with no air cover. 4th December was a tense first day of the war.